Over the last year Grey took over from Magnolia as our fall back colour of choice for interiors, but this is set to be challenged. Pastel shades such as muted greens, powdery blues, buttercup yellows and soft pinks are beginning to fill interior design mags and blogs, so you may be surprised at how modern and versatile this look can be. Offsetting pastel shades with neutrals colours, metallic accessories and crisp clean lines gives this look a much more sophisticated and modern edge than the sugary sweet images people envisage when you say pastels. The lilac in this image is a much fresher take on the colour of the year Radiant Orchid, especially when teamed with this cool teal striped fabric and matching accessories. Mixing pastels with different textures and materials will add warmth and balance to the overall look. Crisp white walls can act as the perfect backdrop to pastel accents, creating a calm and serene space. The natural twigs in this simple vase contrast with the soft cool colours of the modern furniture. 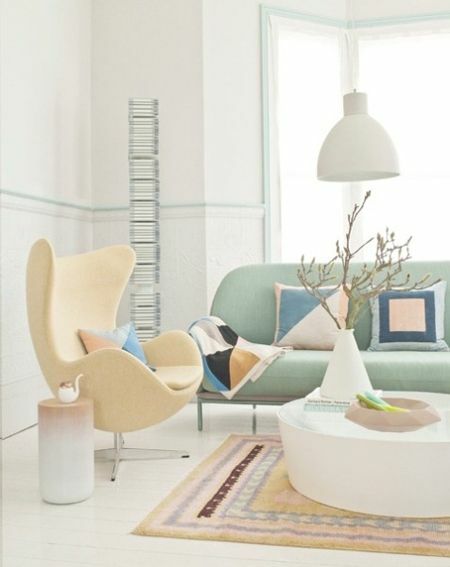 By mixing different pastel shades the look becomes much more playful. These paper poms poms are an inexpensive and great way to add a focal point to large rooms, or a child’s bedroom. Pastel shades can easily be incorporated to other trends such as geometric patterns. This touch of pastels doesn’t have to end in the living room; bedrooms are a great place to clash pastel colours, especially when contrasted with the pale wooden accessories such as this beautiful retro chair. 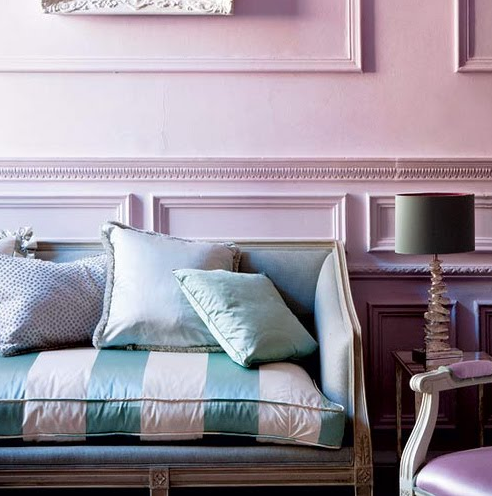 Pastel colours are a stylish alternative to the bolder colour schemes we’ve seen this year, so whether you choose add a splash with accessories or go all out with a new a brand new look you sure to be bang on trend for 2014.